Raising children comes with a price tag — a hefty one. The U.S. Department of Agriculture estimates the average cost of raising one child, from birth to age 17, to be $233,610. When inflation is taken into consideration, that figure inches closely to the $300,000 mark for a child born today. We often hear that purchasing a home is the biggest expense you’ll take on, but raising a couple of children will exceed that for most people. Add in college or the cost of raising two or more children, and you could buy your home twice in most areas. But like preparing to purchase a home, you might want to get your financial ducks in a row before choosing to bring your precious little one(s) into this world. Here are five money milestones you should probably hit before having kids. Establishing a secure work situation before having children is crucial. 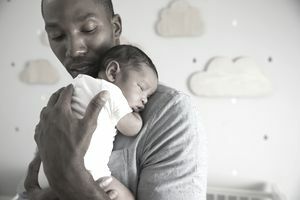 While that can mean traditional employment, self-employment, or some combination thereof, you want to have a stable foundation that will support your growing family. Think about career paths that you can continue after your children are born, and ones with a salary that will cover the expense of childcare — which amounts to about 16 percent of the total cost of raising a child, on average. There is more to take into account than just salary. Consider a career that will afford you benefits like maternity or paternity leave; healthcare and dental care; and that has a decent personal/sick leave policy so that taking a day off to care for an ill child does not mean you’re out of a day’s pay. While $233,610 sounds like a lot (and it is), that amount breaks down to $12,980 annually or $1082 monthly for one child. Use the Cost of Raising a Child Calculator to get a better idea of your estimated annual costs to make sure you have enough room in your budget before the expenses come rolling in. This tool makes adjustments for your income and other variables that will affect your situation. Running these numbers will give you an idea of how much of your disposable income will need to be allocated to raising children. You can even get ahead of the game by saving up a year or more (or as much as possible) of those estimated costs. Because parenting is an adventure that can bring you to the zoo one day and the ER next, being financially prepared for the unexpected when you have children is beyond necessary. From covering the copay for a broken leg to the insurance deductible for your teen’s first fender-bender, having an emergency fund of around three to six months of expenses will protect you and your family from being overwhelmed by life's inevitable messes. As your children grow, the cost of raising them will grow as well, so making sure you’re able to save for retirement before you have them is a good move. Since the responsibility of saving for your retirement will fall solely on your shoulders, contributing to a retirement fund before you have kids will not only secure your future, but will also relieve the potential burden of your children being financially responsible for you as you age. Many people are unrealistic about what it takes to handle the (rising) costs of college. The student loan debt crisis worsens every year, and there is no indication that it’s going to turn around anytime soon. There are ways to lessen the financial burden you and your future children will face when they reach college age, and the best is prevention. If you make sure you’re in a position to save for your kids’ college education from birth, you will set them up to be ahead of the class — at least financially speaking. Ideally, you’ll be able to hit these milestones before having children. But realize they represent a best-case scenario. Not being able to check these all off the list doesn’t mean you shouldn't have kids or that you’re destined for financial ruin if you do. Rather, let them serve as goals to be aware of and reach for. The more of these milestones you’re able to achieve before having children, the less financial worries you’ll have while raising them.